While the first seventeen chapters of the Small Manual of Civility deal with a young man’s attitude regarding general precepts of civility, this chapter and the ones to follow concentrate more on the practice of good manners in society. The Manual offers some fundamental laws of good behavior accompanied by moral considerations. If a young man reads and studies these chapters, he will be convinced that civility is an important part of charity, one of the principal virtues of Catholic doctrine. As a consequence, he will realize that to be a good Catholic, he should practice the most urbane courtesy. Courtesy rooted in principles has nothing to do with the shallow superficiality of the English ‘fop’ or effeminate hero of the romantic novel, who follows the rules of the etiquette book to impress the ladies. The practice of real courtesy produces virile, virtuous gentlemen – like the Catholic knights, men with a love for order and hierarchy. I hope there will be many parents and youth who will consider this text as a kind of class of civility, granting it the same importance as that given to other school courses. In effect, the following chapters can be looked at as a civic-moral catechism, and the well-educated Catholic young man should know the basic precepts of good manners by heart. Of course, such memorization would be useless if afterward, the student did not practice what he was taught, and thence come to observe good manners as second nature. Here, the onus falls on parents and educators, who should be the models of civility for Catholic youth. If adults adopt these precepts, the youth naturally follow suit. Yes, the laws of courtesy demands a certain discipline. Americans will have to set aside many of their spontaneous and carefree habits, and adopt more restraint and self-controlled behavior. But the benefits far outweigh the effort demanded for this return to the respectful, cordial and harmonious relations that belong to our rich Catholic heritage. The greeting is the external sign that gives a person our testimony of esteem, respect or cordiality. It reveals and expresses our sentiments. To greet those we know is an obligation of charity. The way we greet a person reveals whether we are well-bred or untaught in manners. The greeting makes the first impression, favorable or unfavorable, for persons who encounter us in our daily lives. From his childhood, a boy should become accustomed to properly greet the persons he meets. Not responding to a greeting or showing hesitation indicates that the individual still does not have the habit of courtesy. In times past, extreme importance was given to the greeting, which was a public expression of the inequality of the social classes. A man learned the various ways to tip or completely remove his hat, the proper stances, when to shake hands and when not to, the bow and reverence for women. The reverence, kissing the hand of a lady, remains in ceremonials and formal gatherings, and every gentleman should know how to execute it. Although the forms have been greatly simplified in our days, the greeting still has four degrees. First, there is the simple greeting or acknowledgement of a friend or acquaintance; second, the greeting with the handshake; third, a greeting with an embrace, and fourth, receiving the blessing. We should accustom ourselves to greeting persons we know, especially our Catholic friends and superiors who deserve our consideration because of our shared ideals. It is an expression of our cohesion and unity in the battle against the vulgar customs of the modern day world. Meeting a friend or acquaintance on the street or in a public place, the young man should look at the person with a pleasant expression and say, “Hello, Mr. Wilson,” or “How do you do, Mrs. Martino.” A child should never address an adult by his first name. Only a friend or close acquaintance should be greeted by the first name, “Hello, Mark,” or “Hello, Louise.” Avoid the simple “Hullo” and “Hi,” or expressions such as “Hey,” “Give me five, buddy,” or other popular jargon. Crossing the path of a person of authority or higher dignity, it is the younger or less important person who should offer the first greeting. “How do you do, Judge Richards.” The superior replies cordially and briefly. In the military world the same hierarchical principle rules. 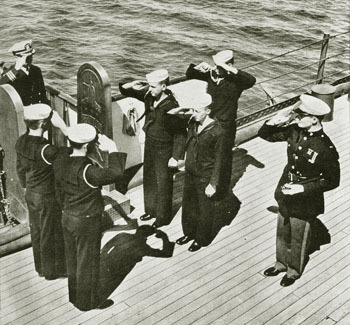 The person of lower rank makes the first salute to the officer of higher rank, who returns the salute. There was a notable exception to this rule in Catholic countries: the higher ranked officer saluted first when he met an inferior accompanied by his spouse; it was a beautiful sign of respect rendered to the sanctity of the conjugal union. The second salutation encompasses the first and adds the handshake. Those who merit it are friends and close relations. The one who is more elevated in social position or older presents his hand in a spontaneous, cordial gesture, without pretension. The one who returns the gesture assumes the same attitude. 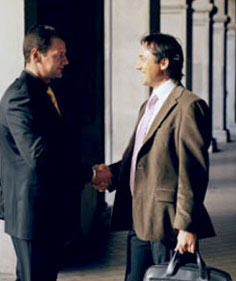 The person of a lesser social position should not be the one to take the initiative in a handshake. It is not necessary for a man to offer his hand to someone he does not know. However, after being presented or some conversation, it is convenient to give this proof of cordiality upon taking leave as a sign of amiability. It is rude to refuse a handshake, and such a violent act is justified only for very serious reasons. During the handshake, the feet should be together and the body slightly inclined forward. The third salutation adds a cordial embrace to the greeting. 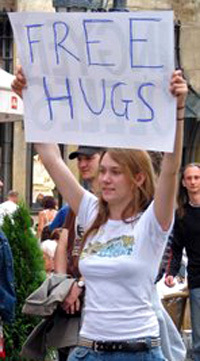 The rules that govern this salutation seem to have been thrown out the window today, with everyone – sometimes even mere acquaintance – asking for or giving “hugs.” Such general abuse, however, does not make such a practice advisable or licit. Rather, it robs it of its legitimate significance and worth. The embrace, if it is to have some value, should only be given to relatives and close friends, among those whom exist a real harmony of views, interests, tendencies and desires, great consideration and reciprocal abnegation, values that realize the ideal of true and sincere friendship. The rules governing it derive, therefore, from the fundamental laws of charity, which make true friends participants in the same aims and ideals, the same sufferings and joys. These conditions restrict the embrace to the circle of true friends. Nonetheless, as noted above, it is common today for these embraces to be given much more freely. There is no reason for these copious hugs distributed to an acquaintance one meets on the street or in a store, or at the end of a superficial conversation filled with banalities. What value do these hundreds of embraces distributed profusely and almost flippantly have? When he finds that he shares it with the whole universe. Therefore, we should exclude from our embraces all those who are not in the circle of our close relations. We should reserve a gesture so noble and significant only for those close to our heart, for our parents and relatives, for members of our household, our benefactors and patrons, persons of true intimacy, such as co-disciples, masters, our companion in battles and sacrifices. Also, for those who are suffering, the victims of personal catastrophes, the poor who need an unequivocal sign of our understanding, it is licit to give an embrace that expresses our sympathy and offers them moral comfort. In my next article, we will look at the fourth way of greeting, the blessing.